Top Notch Material: Win a Beautiful Fall Mongrammed Bag from The Pink Monogram! Win a Beautiful Fall Mongrammed Bag from The Pink Monogram! It's fall yall!! I just love fall and could not wait to bring out the fall clothes! Unfortunately here in Florida, it's often too hot to wear true fall clothes, so many times we depend on accessories! 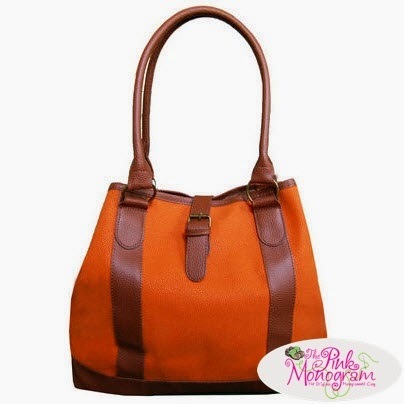 The Pink Monogram just sent me this monogrammed scotch grain beautiful bag in Orange. It is perfect for fall, and is big enough that that I do not need to carry another separate diaper bag like I have been doing lately with my smaller bags. This is perfect for all of my stuff plus diapers, wipes and a sippy! This beautiful bag is wonderfully made, and a quality product! My mom loved it so much she asked why I had to get my initials monogrammed on it because she wanted it as a hand me down! I personally love the custom touch of the monogrammed initials and just love the bag all around! It is naturally stain resistant, and I can tell you it is a lovely bag! At only $46 for the bag and customization, it is a steal! "...Tough faux scotch grain leather which is easy to clean with soap and water, or Steelechasin durable ballistic nylon which looks like canvas and is naturally stain resistant." If you are looking for an awesome, custom gift for your loved one, The Pink Monogram has something for everyone! With over 3000 monogrammed gifts including otterboxes, jewelry, clogs, game day items and robes, there truly is SOMETHING for everyone! Win It: One lucky winner will receive the same bag I reviewed with your own custom monogram. I like the retro pitcher set.I love those kinds of pitchers. I love the monogrammed leather cuff bracelet. They have several really nice bracelets. I like the weekender tote. I like the boyfriend watch in mint green and stainless steel! I love the Monogrammed Pique Dress In Pink With White Trim for my daughter. I like their monogrammed heather pullovers, actually they have tons of stuff I love on their site! Another item I really like is the Monogrammed Weekender Tote Bag in Solid Khaki With Navy Trim. Thanks for a great giveaway! I would love to have the Monogrammed Handcut Raised Initials Sterling Silver Cuff. I love the monogrammed denim jacket. It's very chic for fall! I love the Monogrammed Rain Jacket. I would love to have a Monogrammed Kimono Robe! I would love their Large Oval Bali Bow With 3D Motif Bag. I love the Weekender Tote! Very classy! I would love to have the Monogrammed Geometric Wooden Bangle Bracelet . I would like the Boatman Geller Monogrammed Cell Phone Case. I like the Nameplate Necklace With Hand Pierced Monogram Or Name. I love love love the Monogrammed Sterling Silver Cuff!!! I love the weekender tote!!! I like the Vertical Names Necklace In Rose Gold. I would love to have the Gameday Market Tote. I love the Lilly Pulitzer Lilly Lovers 2015 Large Agenda, thanks! The Lilly Pulitzer Lilly Lovers 2015 Large Agenda looks very nice!